This light and lovely recipe was inspired by Canadian celebrity chef Michael Smith whom I recall watching make something similar on TV years ago. Quick and easy to prepare, it only takes a moderate amount of smoked salmon to make this delicious pasta dish that never fails to impress. As with many culinary endeavours, the better the quality of the salmon, the more flavourful your dish will be, although I’ve used those frozen packages from the supermarket with good results! This dish is fabulous with a garden salad and a glass or two of cold white wine. Adding cream cheese and lemon to hot cooked pasta makes for an easy sauce that complements the smoked salmon beautifully. Bring a large pot of water to the boil; add the salt while it heats up. This will season the pasta while it cooks. Add pasta and cook, uncovered, just until the pasta is cooked through but still chewy. Stir it occasionally while it cooks. Scoop out ½ cup of the starchy cooking water then drain the pasta but not completely, leaving it a bit wet. While pasta cooks, combine the lemon juice and zest with the Dijon and set aside. Immediately return the pasta to the cooking pot along with half of the reserved starchy water. Add the cream cheese and lemon juice mixture to the pasta, stirring gently to combine so that the hot pasta melts the cream cheese. Add more of the reserved cooking water as needed to ensure the creamy sauce coats the pasta well. Add the salmon, dill, capers and green onions or chives, stirring very gently to combine. Season to taste with pepper and serve immediately with lemon wedges on the side. Serves 4. Reheats beautifully with a little added milk, cream or water. 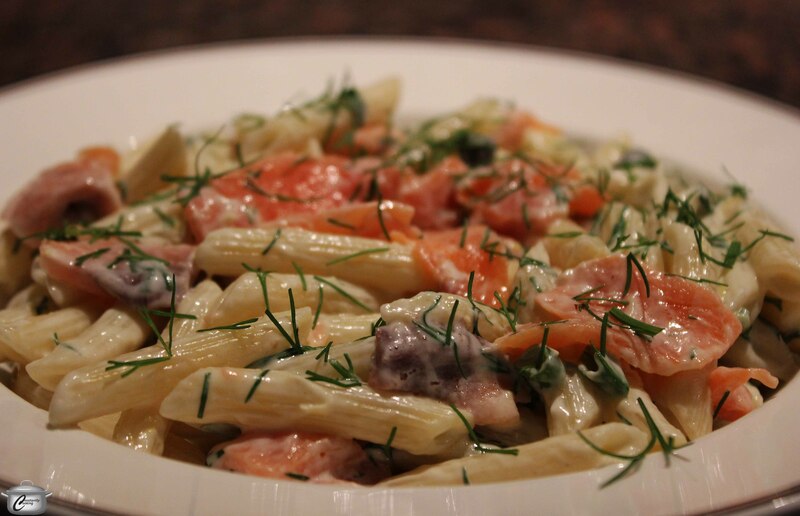 This entry was posted in One dish meals, Pasta and tagged capers, cream cheese, dill, lemon, pasta, smoked salmon. Bookmark the permalink. made it for supper tonight…delicious! So glad you liked it – thanks a lot for letting me know! This was delicious Paula!! I am making it again for a lunch party and was wondering what your tips were for reheating it. I might make most of it in advance and perhaps add the salmon after reheating the pasta and sauce?? Thanks for the great recipe!